Hey guys. It's been a while since my last post here, but we did a good job meanwhile. Beside implementing the features I have described in my previous post I have implemented some other useful features/additional options. Let's see what we have here. First of all I'll just list the options that are implemented already and in the end I'll talk a bit about the next steps. 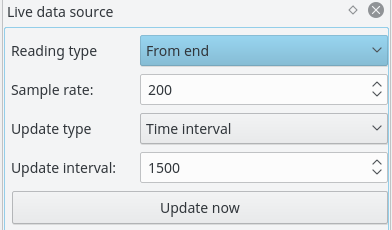 As I told you, for "Periodically" update type the user has to provide a value in milliseconds (planning to extend this to other interval types such as minutes, formatted time values..). For "Continuously fixed" and "From end" reading types the user has to provide a value which is the sample rate. 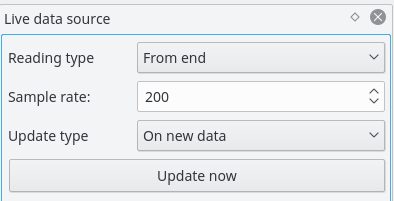 On every update we'll read sample rate number of samples if they're available. The option that I had no words about in my previous post is the "Reading type" one. Let's think a bit, if we have a device that sends lots of data then we may want to check only a piece from the end of the data. For this we have the "From end" reading type. It's possible that we want to observe continuously this new data, but read just some samples at a time. For this we have the "Continuously fixed" reading type. 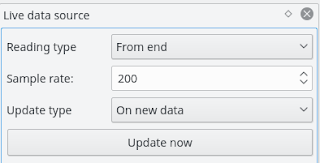 Also it's possible that we need all of the new data every time we update. In this case we have a third reading type, this is the "Till the end" one. 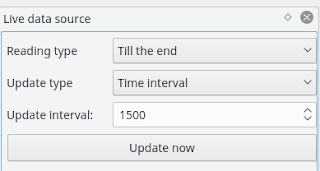 For the "Continuously fixed" and "From end" the user must provide a value (sample rate) to tell LabPlot how many lines he/she wants to read on every update. No worries if the user enters a larger number than the actual new lines, we'll read just as much as we have in that case. 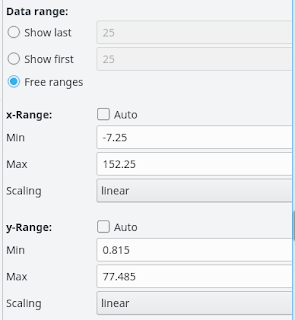 Using our new LiveDataDock we allow users to change almost every option while doing the actual reading. 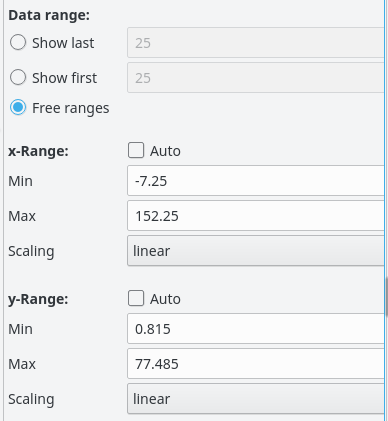 Only the "Keep last N values" cannot be changed, because if we use that we want to have a fixed size that's not changing. For almost every of the newly implemented features I have an example video which was made right after I got it working. 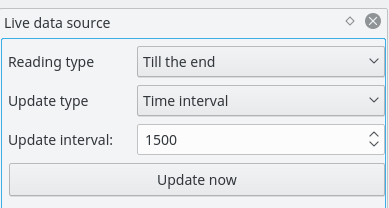 In this video I'm presenting the use of the "Update interval" option. This video is about changing the sample rate and pausing/continuing the reading. The "Update now" button is presented in the video above. This one demonstrates the "Keep last N values" option in action. As you can see I have spent lots of time in these demo videos with the plot setup. We knew we need to speed up this procedure, so one of my mentors (Alexander Semke) implemented the PlotDataDialog for FileDataSources and so in just 1-2 clicks we can get our data plotted nicely. Here I'm using the PlotDataDialog for FileDataSources, you can see the difference I guess :). About the source types: we need to learn a bit about the data extraction from sockets and every source type should be working just fine.